It’s a beautiful, sunny day. A few friends and I have found ourselves chilling out, sitting in a park and having a good catch up… You know how it is. Next minute I see a rabbit who’s looking a bit flustered and evidently in a rush. He seems to be mentioning something about “being late”? Being the compassionate person that I am (either that or I am juts nosey), I follow him to find out if there is anything that I may be able to help him with. Following him into a rabbit hole, I find myself falling down into darkness and suddenly landing at a table where a tea party seems to be taking place. Ideal, I love a good cream tea! 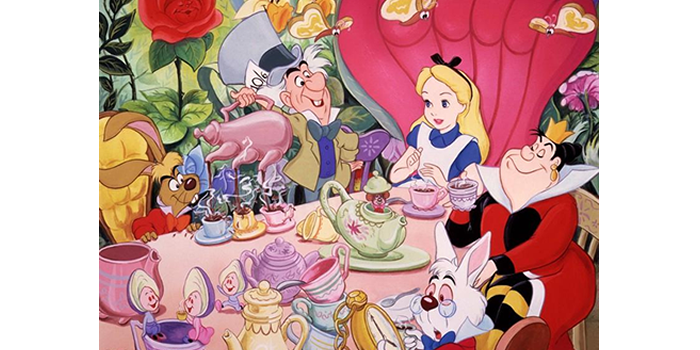 There seems to be a peculiar crowd though… Sat at the table is a Dormouse who seems to be asleep, a hare called “March Hare” and a strange man wearing a huge top hat, who seems to be rather nuts. For goodness sake, I’ve just sat down! Really?! The rushing around starts again. 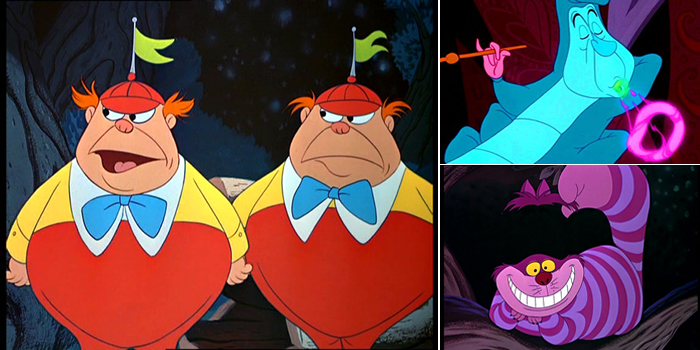 Amongst the bickering between March Hare and the Mad Hatter I can see them both hasting towards my seat. To my left a blonde girl takes a pew (where did she come from?) opposite me, an empty seat. Great, I’ll grab that one! After a few manic seconds of running round the table, everyone seems to have settled and we start pouring ourselves another cup of tea. Brilliant, it’s just what I fancy! The Mad Hatter is going to have to stop doing that! I am not sure what his game is, but I am running out of energy and breath, fast. I still haven’t managed to have a cup of tea yet either! It’s another rush to find an empty seat. Swapping places with the blonde girl (apparently she is called Alice), I find a little bottle next to the cup and saucer. 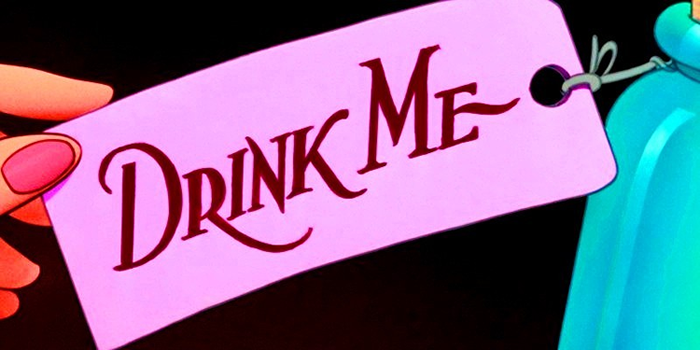 Attached to the glass bottle, containing what looks like water, is a little tag that has “drink me” written on it. Gasping for a cool drink (I am so unfit) I can’t help myself and do exactly what the tag tells me… Wait, what? I am shrinking! That’s a bit easier now I am tiny (silver lining and all that). I find myself running across the table, watching the March Hare trip over the Dormouse (still sleeping). Trying not to laugh at him, I am dodging the dinner plates and other crockery rather than the other guests. Having found an empty seat, I dash towards to the chair. During my travels, I stumble across a cake that says “eat me”… Okay, sure- what harm is a cake realistically going to do? I am so hungry from all the running round anyway! You’re kidding… I have gone from being tiny to becoming a giant… Oh no! Not being able to move much without damaging anything or hurting anyone, I stay put. This has given me a good chance to have a look round me. The Mad Hatter has run into Alice, nearly knocking her unconscious. There are now twins who have joined the tea party as well, they’re called Tweedle Dee and Tweedle Dum (unusual names, but at this moment in time nothing is surprising me). As the two boys fight over one chair, I notice the same rabbit from earlier, still in a rush looking at his pesky pocket watch. Might have to be the last time I am so nosey! I wish I could! I am still huge and would do anything to swap places with anyone at this point… I do keep telling myself to cut out the cakes, another lesson learned! Just to add to the weirdness happening around me, a striped cat appears next to me, looking rather smug. Thankfully, after some really strange conversation, the Cheshire Cat offers me part of a mushroom that brings me back to normal size. It’s so good to be me again! Laughing, rather creepily, the Cheshire Cat vanishes. I am so confused right now! Also, does the Caterpillar who has just joined know that it is a non-smoking zone? Alright, alright… Wow, it feels so good to be able to run around as normal again! Like partaking in an assault course, I’ve jumped over the Cheshire cat (honestly, where does he keep coming from? ), swerved round the Mad Hatter (was so tempted to grab his hat), run through a smoke cloud that the caterpillar has blown into my face and nearly face palmed who I think was Tweedle Dum. Finding an empty seat, that first sip of freshly poured tea is blissful. Hang on, we have an extra guest! Who is the moody queen dressed in hearts? It’s starting to get rather crowded round the table now. Quite the tea party! This is getting tedious now! Just as I was inspecting the dining furniture, trying to work out where they got it from as well! With the Mad Hatter having booted me out of my chair, I join the rest of the guests looking for somewhere else to sit. It was a lot easier when I was tiny (I’m never happy, such a diva). The obstacle course starts again and like being on Ninja Warrior UK, I avoid one of the twins (I think it was Tweedle Dee this time, but I am useless with remembering faces). 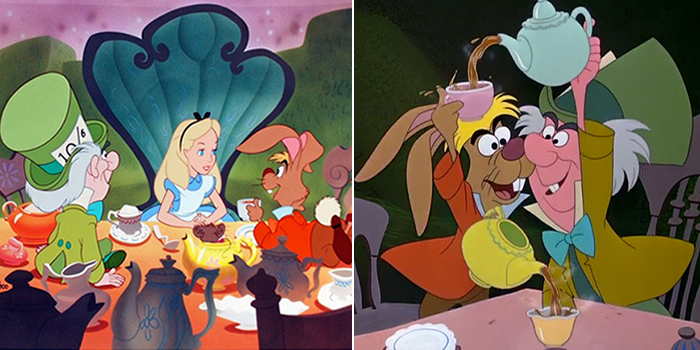 March Hare is running across the table, knocking everything over and still bickering with the Mad Hatter. I spot a free seat…! Oh wait, Alice has just taken it… Come on! Oh look, the rabbit and his pocket watch again…. Still desperate for a cuppa, I take a look round the table for another seat. Nice one, there’s one next to the steam engine, I mean caterpillar. Perfect! Ignoring the “card-guards” for the moment, I pick up my cup of tea. I have waited so long for this, so the Mad Hatter better not mess it up for me! Before the cup even reaches my mouth, I wake up… Wow, what a dream… What a Wonderland!